The Write Way Café welcomes Skye Taylor, who shares writing experiences and her affinity for strong heroes. When did you first have the thought you'd like to write a book? Was that first thought related to writing romance? Unlike many of my peers, I loved the English teacher I had in my junior and senior years of high school. He was strict and deducted heavily for misspelled words. He expected us to take the time to look up if we didn’t know, but he inspired us to dig deep. Our assignments weren’t what we did over the summer, but things like 500 words on an odor we loved or hated, describing it and how we felt about it. Daunting at first, the challenges this man presented us with showed me I had both a talent for and a desire to write. My first attempt at a novel was a Regency romance – mostly because I was heavily into Georgette Heyer at the time. I currently have a contemporary romance series going with three books out and the fourth coming in July. 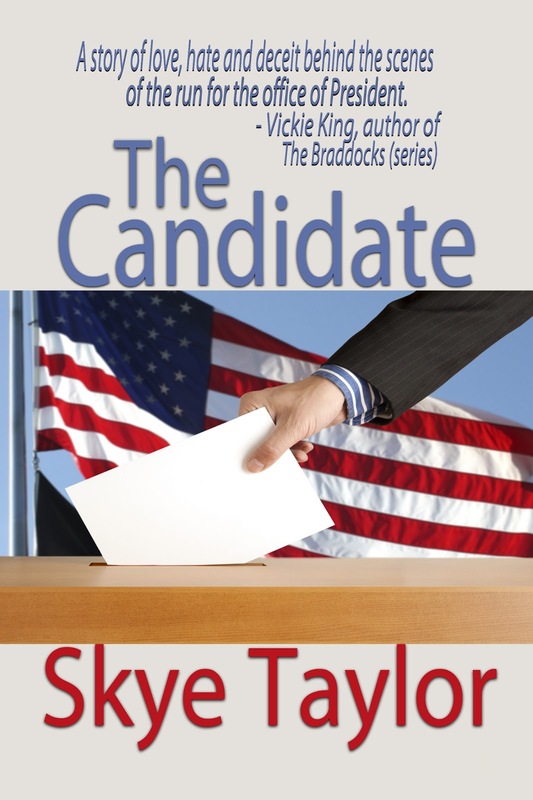 But the most challenging book I’ve written to date was The Candidate, which started out as one man’s struggle to find personal honor during a hotly contested presidential campaign, then ended up including three candidates and each of their individual battles. Weaving all three stories together with a touch of romance thrown in was a major challenge. The Candidate placed second in strong romantic elements in the Reader’s Choice Awards, but it is a mainstream intrigue. What was your path to getting this book written and published? What type of research did you do? Since my main character is confronted thirty years after the fact with memories of his time in Vietnam, I had to do considerable research into the events surrounding the evacuation of the embassy in Saigon as well as interviewing my brother and other veterans about their memories of those years. I wanted to honor their service in a way the American people did not when the soldiers came home after their year in hell, and I wanted to do it with compassion and understanding. I also needed to research the nuts and bolts of a presidential campaign, which I knew nothing about. The book was written originally some years ago and then had to be updated to be politically current when it finally sold to eWings Press. When people ask me why I wrote this particular book, I often give them a flippant answer about not liking any of the current crop of candidates so I decided to write one of my own I could really root for. But the more serious answer is that it sprang from a number of things: The musical "Miss Saigon," non-fiction books about the men and women who served in that war, the TV show China Beach and my brother’s own both painful and humorous memories. My characters are entirely creations of my imagination. And there’s nothing of my personal experience in this story either. But I did come of age during the height of the Vietnam War, and experienced first hand the treatment a populace angry about the war dished out to the men and women who went either voluntarily or by draft. I pay attention to current events as well, the scandals, the dirty politics, the erosion of faith in our leaders and some of that has found its way into my story. At one point, with five main characters whose points of view I told this story through, I felt like I had the proverbial tiger by the tail and the story felt totally out of control. But then I went to a conference and heard a wonderful presentation on keeping a handle on story arc and multiple characters by T. Davis Bunn. There’s no way I can summarize his three hour workshop here, but in the end, the nugget I brought home was a simple sketch he drew showing how the individual story arcs come together and at that point every character is either for or against the outcome you have planned. I came home and sketched out each of the five story arcs, and suddenly my novel came together. I learned some things about my brother I didn’t know. They were very personal and rarely if ever shared so I felt honored that he trusted me with his thoughts and memories. In my updated version, I include a man with a hot current issue and my research into his background, emotions, struggles and triumphs, so totally different from my main character it was enlightening, and reminded me not to judge others by personal convictions. I work at a desk set under a window overlooking the ocean with all three walls behind me filled with floor to ceiling books. I love the feeling of being surrounded by books and I love having all my resources close at hand. I also love being able to gaze out at the ocean when I sit back to contemplate some knotty bit of plot. Walking the beach is where I work through plot lines, dialog, and scenes when they stop flowing while I’m typing, so living this close to the ocean is fantastic. As a child Heidi was my favorite book. I so wanted to be Heidi and live life on that mountain. My childish heart was very much in love with Peter. In my early adulthood, I fell in love with a trilogy that had been written during and just after WWII and set on an island off the coast of Maine. Again, I was more than a little in love with the hero, but I was also enamored of island living. Outlander, by Diana Gabaldon and On The Island by Tracey Garvis Graves are my current favorite books and I’ve read both more than once. Again, it was the hero I fell in love with most. Both authors have created wonderful settings and a story that engages, but their heroes are what caught my heart and held it. Both were young to start and while brave and intelligent, had a lot to learn about life and love, but flawed as they were, they grew in stature and honor. Jamie Fraser (long before the Starz series and Sam Heughan) and T.J. Callahan are heroes that capture the heart and don’t let go. I loved Simple Jess by Pamela Morsi and The First Boy I Loved by Cheryl Reavis. As I write this, I’m seeing a pattern that doesn’t surprise me, but I’ll admit, I’m different than a lot of other romance writers and readers. The heroines are important, but for me, it’s the hero I fall in love with that makes the book memorable. I might also add that none of these heroes are wealthy, powerful, or influential. They don’t fit the traditional boxes. Jessie Best is a simple man with simple desires. Jamie Fraser is a wanted man. T. J. Callahan is a teenager at the beginning, forced by illness and circumstances to grow up fast. They are ordinary men who rise to extraordinary heights when faced with adversity and challenge and that is what makes them memorable. I’m currently finishing up the final edits on a historical time travel set during the American Revolutionary War and when that’s submitted I have another paranormal plot brewing in my brain about an author who falls in love with a shadowy hero from WWI that she is researching for a book she wants to write. I also have two more books, one written but in need of edits and one unwritten as yet in my contemporary Camerons of Tide’s Way series from Bell Bridge Books. Obviously the answer to this is yes. The Candidate is mainstream intrigue, while The Camerons of Tide’s Way are contemporary romance (with a hint of women’s fiction,) but I’ve written straight historical and time travel as well. Who is your favorite hero/heroine? Since I’ve already talked about my favorite heroes, my favorite heroine is Joanna Bennett from Elizabeth Ogilvie’s Tide Trilogy (High Tide at Noon, Storm Tide, and Ebbing Tide) I think, because I feel I’m very like her. I can be headstrong, but I love deeply. 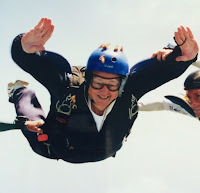 I throw myself passionately into things I believe in and I love adventure. I consider myself a leader rather than a follower and Joanna Bennett is all those things. It’s down to the last two months in a neck-and-neck presidential election race. Matt Steele is trying to run a clean and honest campaign, while not alienating his party base with details of the harsh economic realities he knows he will have to embrace if he wants to restore the American dream. While campaigning, he is slipped an old snapshot by an Amerasian immigrant. The photo took Matt Steele off guard, jerking him back to a time he’d done everything to forget, to emotions he never wanted to relive. In the midst of a hotly contested race for the White House, the photo and the man who brought it to him will challenge everything Matt thought he knew about himself. The choice he faces to put honor on the line could change the outcome of the election and the fate of a nation. Skye Taylor lives in St Augustine, Florida, enjoying the history of America’s oldest city and taking long walks along its beautiful beaches. She’s a mother, grandmother, and returned Peace Corps volunteer. She posts a weekly blog, volunteers with the USO, and is currently working on a time-travel romance and a mystery novella. Her published work includes: The Candidate, Falling for Zoe, Loving Meg, Trusting Will. Free Short stories: Loving Ben and Mike’s Wager and non-fiction essays of her experiences in the Peace Corps (Available on her website.) Book four of the Camerons of Tide’s Way series from Bell Bridge Books, Healing a Hero will be out in July. Also available on her website is a free short story, Saving Just One. Great interview, Skye! Your writing space sounds like the perfect space for writing. Thank you for being with us today! Enjoyed reading this. Look forward to reading The Candidate. have read much of Skye's books and stories and enjoy them immensely. I have and do recommended The Candidate as a fictional but relevant way of looking at politics.